Summer is halfway over. Seriously, how did this happen so quickly?!? 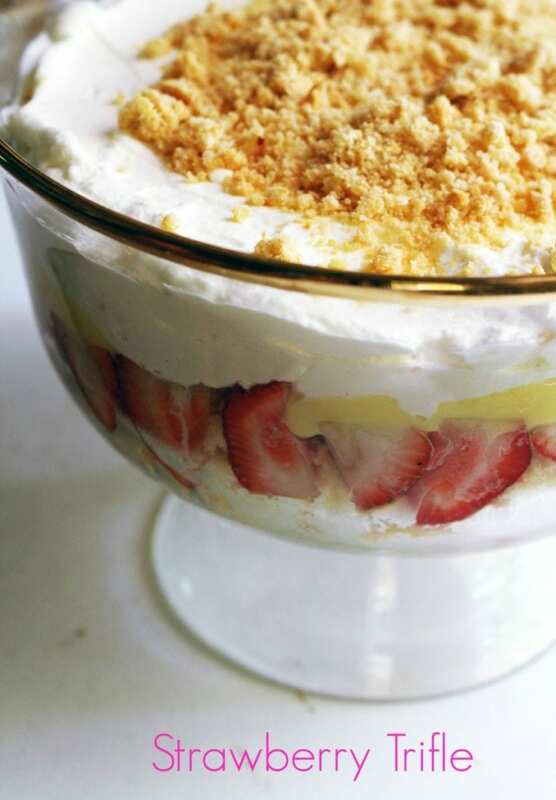 But before it ends, you must make this strawberry and amaretti cookie trifle. It is the dessert to take your mind off the heat and the one to make to impress a crowd of family or friends (or both)that are visiting for an impromptu dinner or lunch! We just got back from our trip all around Italy. This trip we made it back to Sicily and even to Calabria to visit family. We were all over Italy from Valle D’Aosta to even the Adriatic Coast to visit one of my favorite Italian places: RIMINI!! I feel like I usually feel after a long way away: tired and yet still somehow, refreshed and excited. I’m excited that we had the chance to see so much of our family (mine and my husband’s) and I’m excited for all the different things we tried and the places we visited. The tired feeling is from the 6 hour time difference. I suffer massively from jet lag. So does my son! The other half of my family feels no difference when they get back from Italy. I, on the other hand, am all sorts of confused. My stomach is confused. I’m ready for a big bowl of pasta by 8AM (which would be 2PM Italy time) and I’m hitting a wall by 4PM…completely ready to get in my PJ’s and get ready for bed. I try to have an espresso and try to keep going until at least 9PM, but it’s futile. It is so hard the first few days back for me to keep my eyes open past 8:30. We even were watching a fun movie the other night and my daughter was nudging me several times to wake me up and my son had already been sleeping 20 minutes on my lap. SO I’m super happy to be home, I just wish my brain would catch up a little more to the fact that we are no longer on Italian time and get back on schedule a little quicker. I tried to keep a journal of all that we ate and all the different recipes my mother-in-law was cooking. I did keep up with most of it and will share some things here!! Every night was something amazing and most times, something simple. Typical evening would entail me accompanying Teresa down to her cantina to get down to business. 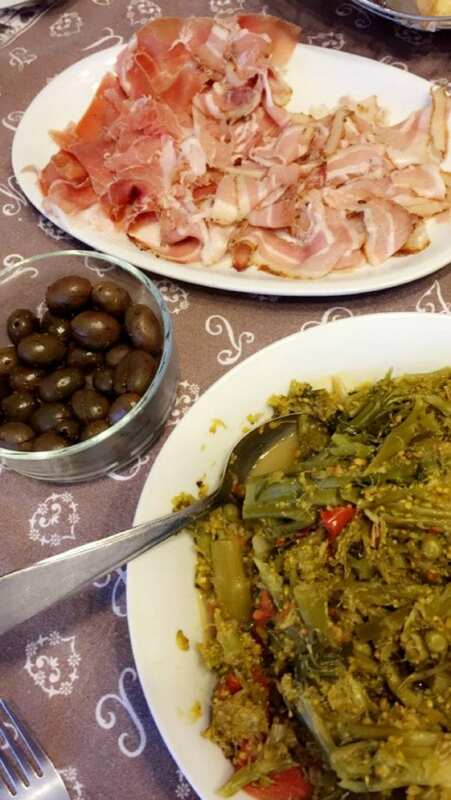 The business was getting into slicing her homemade pancetta and capicola. I tried to resist not eating too many slices. But between the bread and her olives, it’s impossible to resist! But, hey! There was even a side dish of her broccoli made Calabrese style. Teresa is so kind and thoughtful and always thinking of us and how to share food with us even when we aren’t there. 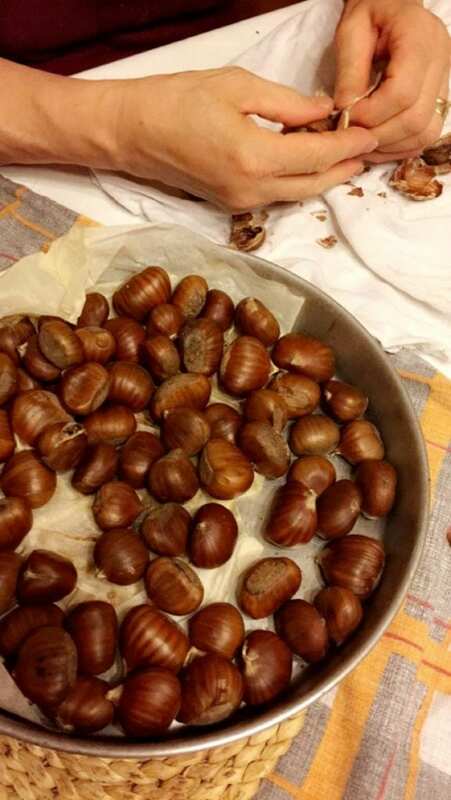 She even saved chestnuts from this past winter for us to try. She knows how expensive they are here. The first 10 days we were in Italy it was actually raining a lot and very chilly (sometimes very cold)so it was nice to enjoy some roasted chestnuts on a cold June evening. Here’s a quick photo of the trifle while I was assembling it. It was loud and busy in my kitchen and I couldn’t get any more photos. This is a really easy no-fuss summer recipe. You could use pastry cream that you make yourself or you could use pudding. Go ahead and use instant pudding to keep it simple and keep it quicker. If you have time to make your own pound cake, go ahead and use it. But if your short on time, feel free to but a pound cake. I whipped my own cream. It is so simple to do and in my opinion, tastes so much better than store bought. But again, if you are short on time or desire, you could use the ready whipped. I chilled my trifle for about an hour before serving and sprinkled on the crushed amaretti right before serving. This was made for quite a big family lunch and it was a miracle I even got one photo of it. The perfect no-fuss dessert to enjoy all summer. 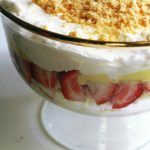 This Strawberry and Amaretti Cookie Trifle is so easy to make and lovely to enjoy at a summer party! Place the sliced strawberries in a small bowl with the sugar and the liqueur (or orange juice). Stir it around and set aside. Let the berries soak up the flavor. Cut up the pound cake. If you don’t have pound cake, you could use lady finger cookies. Whip the cream until soft and fluffy; set aside. Make the pastry cream (or pudding); set aside. Layer the strawberries on the bottom of your trifle bowl. 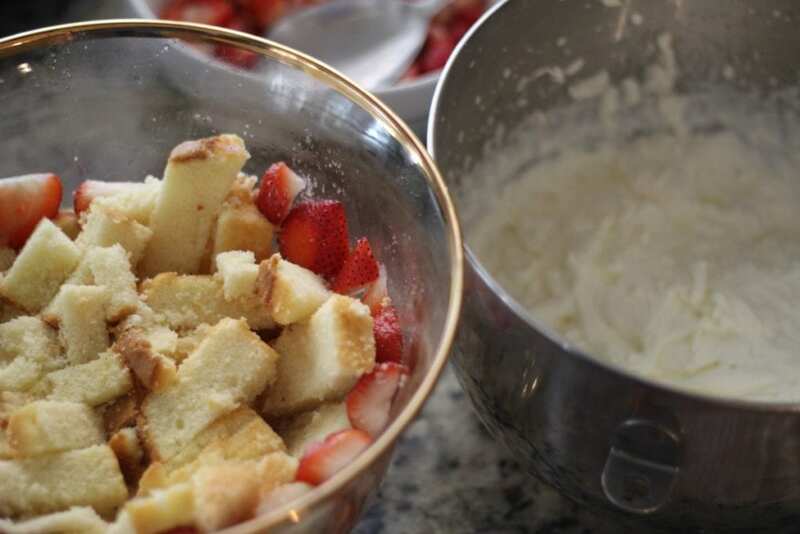 Place the pieces of cut up poundcake on top of the berries. Spoon on the pastry cream (or pudding)and spread on top of the pound cake. Spoon on the whipped cream and spread it evenly around. Chill for at least one hour. Before serving, sprinkle on the the crushed amaretti cookies.